Who are the authors? Founders of WineFolly.com, Madeleine Puckette, a certified sommelier, and Justine Hammack. The site was named Wine Blog of the Year 2013-2014 by International Wine and Spirits Competition. What’s it about? 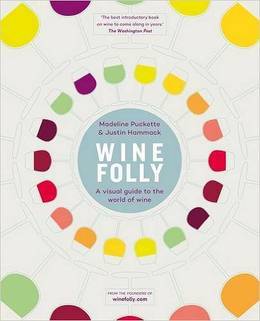 Wine Folly: A Visual Guide to the World of Wine aims to help people understand the fundamentals of great wine. From tips on which glasses to use, to simple tasting and food-pairing notes, this modern infographic guide will equip you with the knowledge and confidence to enjoy great wines. Good book for: Those of us who need simple guidance to get over the challenges of getting into wine.The book provides practical knowledge that is immediately useful to help you find and enjoy great wine. You’ll like it if: You like wine, but want to know more about it!